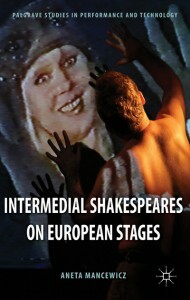 Global Shakespeares European Regional Editor Aneta Mancewicz has published a book Intermedial Shakespeares on European Stages (Palgrave 2014) that examines the application of digital media in European Shakespeare performances in the 21st Century. The book makes reference to Global Shakespeares project and discusses two plays which are available on the website: Hamlet gliwicki, directed by Piotr Lachmann (Poland), and Hamlet, directed by Maria Federica Maestri and Francesco Pititto (Italy). 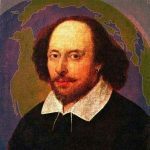 Intermedial Shakespeares on European Stages argues that digital intermediality over the past decade has refashioned Shakespearean performance in Europe. Defining intermediality as a reflexive interrelationship between live and digital media on stage, the book examines stagings of Shakespeare in Germany, Italy, the Netherlands, Poland, and the UK, and situates them in their linguistic and cultural contexts. It focuses on the ways in which text and author, time and space, actor and audience have been redefined in performances that incorporate digital media. It also traces transformations in cultural practices related to shifts in staging techniques in intermedial Shakespeare productions. It addresses the implications of digital coding of data, virtual reality, and global communication networks.